As we walked in the lobby of our hotel, a smiling, energetic man approached us and told us he'd heard that the Rick Steves' tour had been cancelled! Yes, this was Mert, our group leader. Little did we know the treat we had in store - we found out during the trip that Mert was amazingly informed, full of enthusiasm, caring, kind, and - very funny! During our group meeting, as each person introduced themselves, my nervousness disappeared. I could tell this group would be wonderful as fellow travelers. In Fred's introduction, he mentioned that I 'dragged' him on the trip. I only include this to illustrate the COMPLETE transformation later! Some of our group were embarking on their 10th Rick Steves' tour! Rick has a huge fan base because he offers such great travel experiences. After our meeting, Mert conducted our first walk together through Old Town. Along our way, we passed shop windows filled with Turkish pastries sprinkled with crushed pistachios. Yum!! This man is balancing 'simits' on his head. We learned that they're dough sweetened with molasses and dipped in sesame seeds before baking. 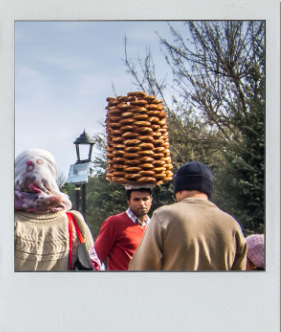 This is a typical Turkish 'fast food' snack. Of course we had to buy a couple and sample. Turns out that they're VERY good. It was amazing how these food vendors could carry and balance so many simits, taking them down and putting them up again as they sold. There's continual hustle and bustle outside the Spice Market, where we see a combination of traditional and contemporary dress. Many Muslim women choose to wear head scarves. 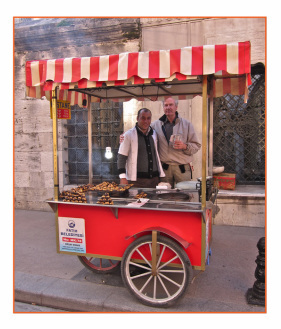 Small carts selling roasted chestnuts are all around. The aroma is wonderful, and I'm really not sure just how many people buy. I never saw anyone else but us. We had to try them. Not bad - a little dry. The best part was the friendly vendor. 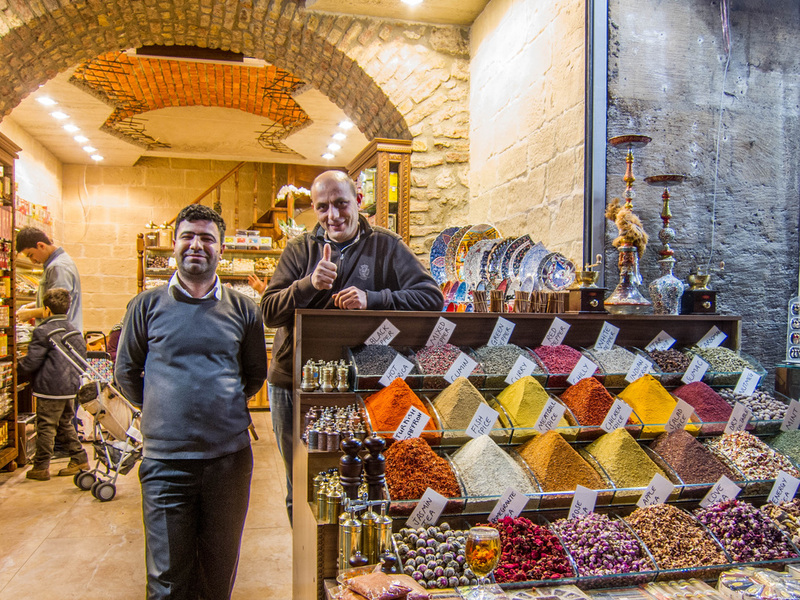 Mert gave us a few minutes to explore the Spice Market, which is hardly adequate for a serious shopper like me (we came back later). There's so much for sale but the stalls with spices attract me the most. Besides crushed herbs, there are flower buds, seeds, and MANY kinds of saffron. 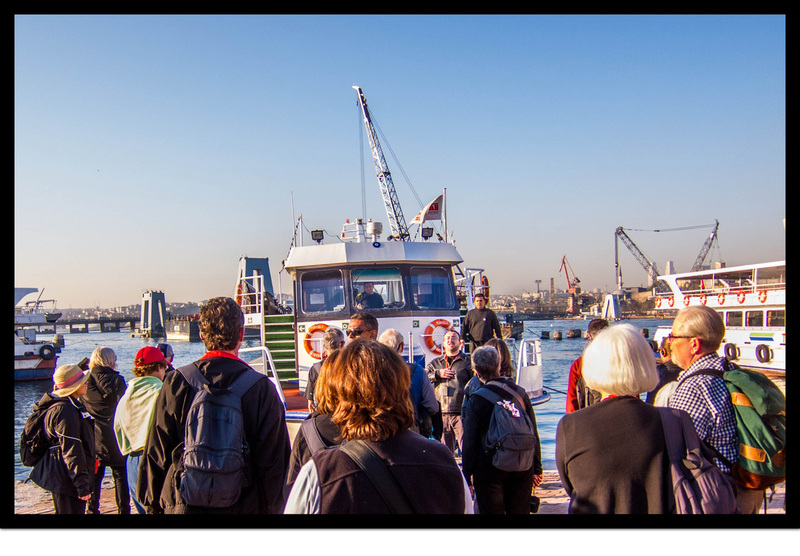 Our walk led us to the waterfront where we boarded our own private boat for a cruise along the Bosphorus Strait. While sipping hot tea from traditional Turkish glass cups, we had a first-class view of both sides, the European and the Asian. We passed grand mansions, palaces (including the Presidential Palace), old fortresses, and small communities lined with waterside cafes. On our way back, the sun was setting and we were treated to a beautiful setting sun. These bright and colorful little boats bobbed alongside the area where we disembarked. They sell only one thing - fresh fish sandwiches. The smell of grilled fish was divine!! By this time, Fred and I were hungry and we were tempted to sneak into one of the boats and grab a sandwich to go, but when Mert told us that we were now on our way to a great dinner restaurant, we figured that we could control ourselves a little while longer. It was now dark and everything looked different as we walked back to Old Town. Mosques were illuminated and there were glowing lights from inside shops and restaurants. How many restaurants can boast that their back room is an archaeological excavation? Our first pre-dinner treat was being led back to an area that dates to the time of Constantine. These vaulted ceilings and bricks are over 1600 years old! The sign read that over 600 tons of rubble (so far) have been removed and that the area was once part of Constantine's many palaces. And now, dinner is served! With beautiful food and presentation like this, it's so tempting to keep taking photos but hunger, and Fred, finally pulled me down to eat. Look at this lavaş (flat bread)! It came to our table hugely puffed up and steaming with fresh baked aroma. After our delicious meal, we walked back to our hotel and Mert gave us our 'instructions' for the next day. We were going to be busy and have a lot to see, so we planned to start early. After such an exciting day though, it was hard to settle down and sleep!